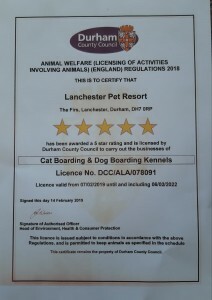 We have a variety of different styles of accommodation to suit all dogs and cats. All our enclosures are heated and secure, with night-vision CCTV covering the entrance to our site, so that you can relax and enjoy your holiday in the knowledge that your pet is comfortable, safe and cared for. We offer a choice of accommodation for dogs; you can choose our standard enclosures, with an indoor sleeping area leading to a secure outdoor run, larger family units, or our bungalow style apartments with TVs, and large human-style beds for your animals to enjoy (left). We’ll let your dog out of their unit four to six times each day, allowing them time to run free in our enclosed exercise field; we’ll only let your dogs out by themselves, they’ll never be left with another customer’s animals. We are unable to take short bookings of less than 5 nights over the school holiday periods. Please book early to avoid dissapointment. Each cattery enclosure features beds, scratching posts, toys, and plenty of places for your cats to have a good climb. Our purpose built cattery can accommodate individuals or families; for larger groups, we can join two enclosures together if required.Of course, they’ll get plenty of cuddles and affection whilst they’re with us, too.We’ll provide beds, bedding and quality food while your pets are staying with us, but we’re happy for you to bring your own food with you if you wish, and they’ll always have fresh water. All enclosures are cleaned daily, and we give the enclosure a deep clean with pet-friendly disinfectant before each new occupant checks in.Your pets will have their own enclosure, and will have playtime by themselves, so there’s no need to worry about how they’ll get on with other residents. Each enclosure has music playing to keep your animals company, or a TV in the dogs’ bungalows.All animals must have an up to date vaccination certificate; we will not accept your animals for boarding without first inspecting the vaccination certificate. You need to bring Micro chip details too. We highly recommend that your dog has an additional vaccination against kennel cough, which should be done at least five days prior to boarding. We are unable to take short bookings of less than 7 nights for the cattery in July and August due to limited spaces. Should your animal be taken ill whilst staying with us, we are trained in animal first aid, and the services of a veterinary surgeon are available 24 hours a day. Due to new laws, we are unable to give insulin injections. All stays are subject to our terms and conditions.